Bond investment is not for everyone. Bonds or fixed incomes are municipal, government, and corporate debt that pay interest. The typical purpose of a bond fund is to provide a stable income stream for investor with minimal capital risk. The bond value usually doesn’t move a lot compare to stock value. Some of these bond interest or yield will be taxed or won’t be tax (i.e. tax free). High Yield Bond. This bond invests in securities from corporations or businesses with non-investment-grade credit ratings or “Junk bonds”. International or Global Bond. International bond invest in securities or debts issued by corporations and governments outside the U.S whether it is European companies, Emerging markets countries etc. National Municipal Bond. This national muni bond will invest mainly in investment-grade municipal securities. The fund seeks to provide income exempt from federal income tax. State Municipal Bond. This single state muni bond invests principally in investment-grade municipal securities. It also seeks to offer income exempt from federal and state income taxes. Fidelity investments are well known to various investors or traders. Fidelity is the online trading brokerage account with various investment product such as ETFs, mutual funds, IRAs, retirement planning and investment solutions. Fidelity has the most 4 stars and 5 stars rated fund in Morningstar Rating. Investor can use Fidelity Brokerage to buy these high rated mutual funds with no fees. The customer service is one of the best in the brokerage industry. It has several well known mutual funds with such as Fidelity Contrafund, Fidelity Magellan and Fidelity Puritan. Fidelity also offers various mutual fund products such as active mutual fund, index fund, and Portfolio Advisory services. Fidelity offers a mutual fund screener or selectors. Investor also can invest in other NTF fund family for free. 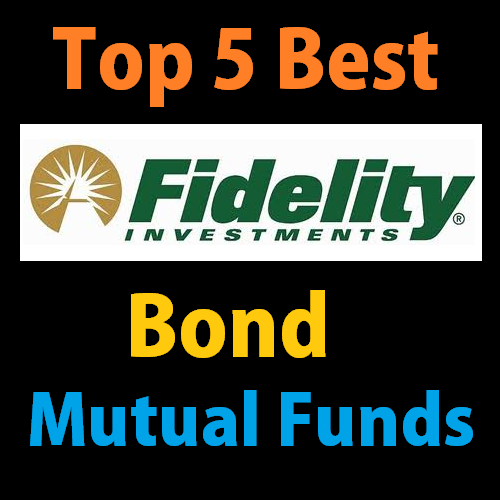 How do I select the best Fidelity Bond Mutual Fund? The first criterion is always looking at the comparable asset with other fund family when I’m screening for best bond fund. The total asset should be big and huge. Huge fund net asset means individual investors and institutional investor will invest in this fund first before other fund. The next criterion is the Morningstar rating. The bond fund should have a 3 star rating or more. 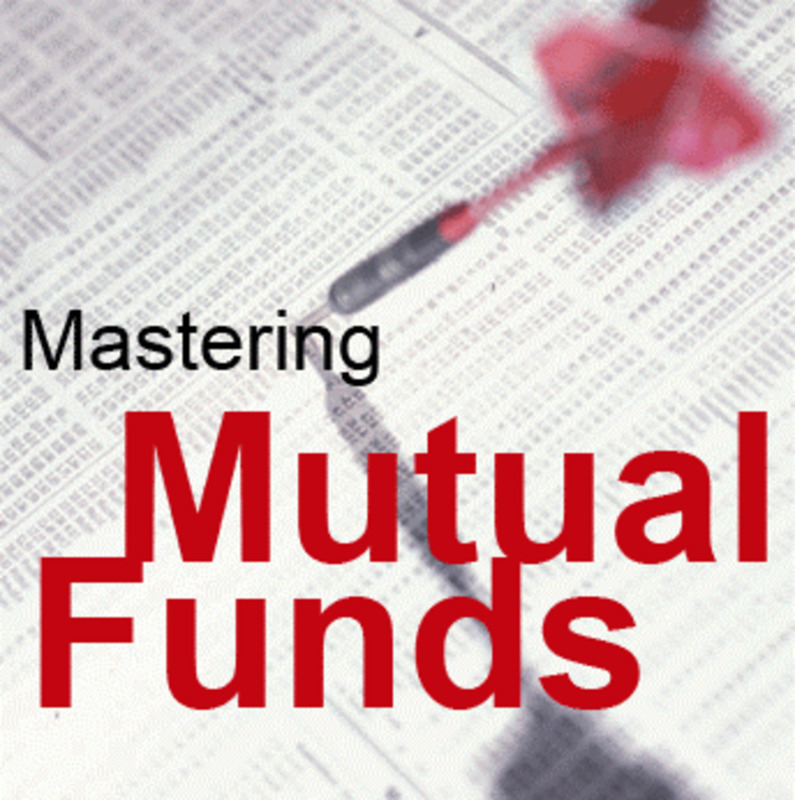 The high rated mutual fund usually can withstand any market conditions. The third criterion is the low fees associated with the fund such as expense ratio, sales charge (front end sales or deferred sales charge), and 12b1 fees. To trade these mutual funds, you will need to open Fidelity Brokerage Account. For typically Fidelity fund, you will need $2,500 initial balance to meet the minimum investment capital. 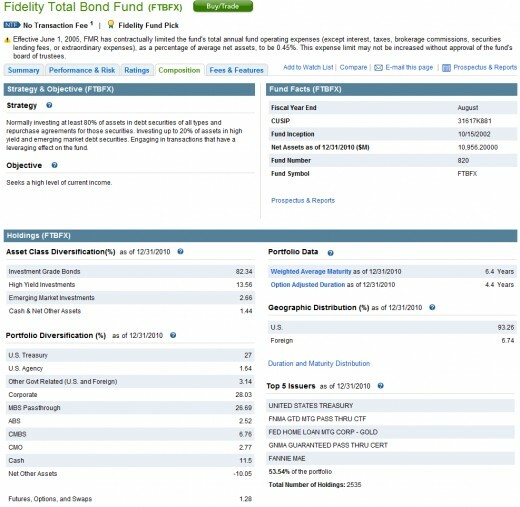 Fidelity Total Bond fund is the Fidelity flagship bond fund. This bond fund has the largest asset in Fidelity bond funds. The fund investment objective is to providea high level of current income. The fund adviser uses the Barclays Capital U.S. Universal Bond Index as its guide in investing assets across the investment-grade, high yield, and emerging market asset bond sectors. The fund lead manager is Ford G. O'Neil since 2004.The fund has returned 8.70% over the past year and 7.37% over the past three years. There is no front end sales load and no max 12b1 fees. The total expense ratio is only 0.45% and is very low compare to other actively managed bond funds. To invest in this fund, you will need to have $2,500 for initial investment purchase. For 401k, you can invest per your account rules. The fund also is rated 4 stars per latest Morningstar rating. The Top 5 sectors of this fund are Corporate Bond, US Treasuries, Mortgage Backed Security (MBS) Passtrough, Commercial mortgage-backed security (CMBS), and Other Government related bonds. The Average Credit Quality of the bonds in this fund is BB according to Morningstar. The Weighted Average Maturity bond is 4.4 years. As of January 2011, the top 2 asset class diversification is Investment grade bonds (82.34%) and High Yield Investments (13.56%). The Fidelity Capital & Income fund is one of a no-load and high-yield bond funds Fidelity offers. With high yield expectation, the fund is high risk and very volatile. 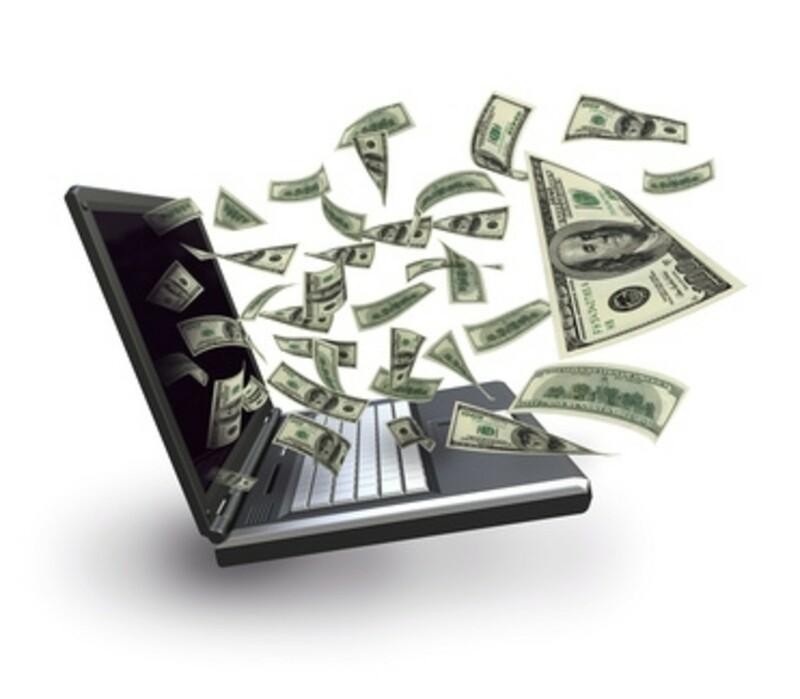 The fund investment seeks capital growth and providing income to investor. 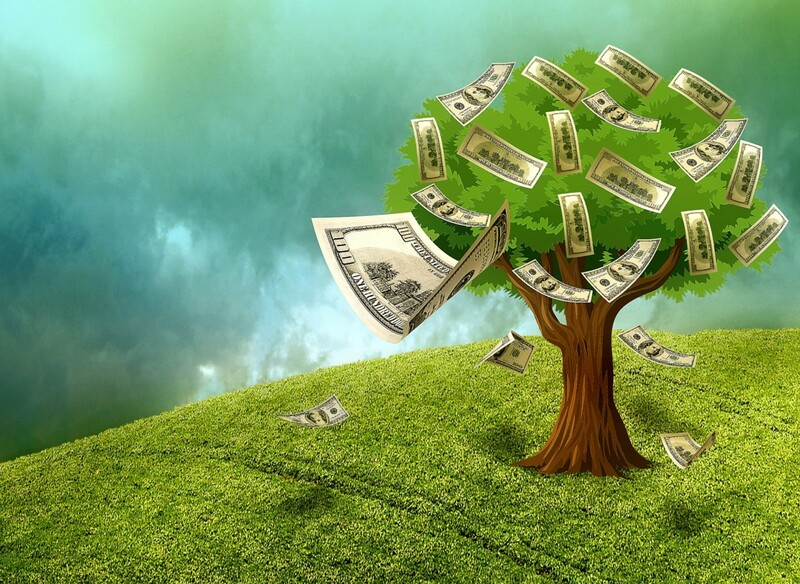 The fund typically invests in equity and debt securities, including defaulted securities, with an emphasis on lower-quality debt (non investment grade bond or junk bond) securities. It may invest in companies in domestic and foreign companies / issuers. The fund lead manager is Mark Notkin since 2003. The fund has returned 18.90% over the past year and 9.63% over the past 5 years. There is no front end sales load and no max 12b1 fees. 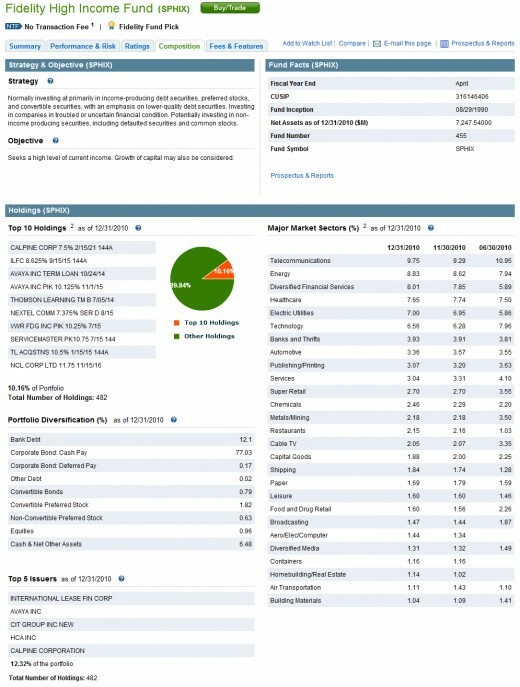 The total expense ratio is only 0.76% and it is also rated as the top rated Morningstar bond fund with 5 stars rating. You will need to provide $2,500 minimum balance to purchase this Fidelity Capital & Income bond fund. The Top 5 sectors of this fund are Corporate Bond, Equities, Bank Debt, Cash & net Other assets and convertible bonds. According to Morningstar, the average credit quality of the bond fund is B. The Weighted Average Maturity bond is 7.0 years. As of January 2011, the top 5 bond issuers are Sprint Capital Corp, GMAC Inc, Texas Competitive Electric Holdings Co, Digicel Group Ltd, and Intersat Bermuda Ltd.
Fidelity US Bond Index is one of passively managed index fund offered by Fidelity investment. The fund aims to replicate the major characteristics of the Barclays Capital U.S. Aggregate Bond Index. The fund normally invests >80% of its total assets in bonds included in its followed index. The fund’s portfolio is made up of a range of government related, corporate bond, and mortgage-backed securities. The fund lead manager is Curtis Hollingsworth since 2009. The new management will try to match the index more closely than previous management.The fund has returned 5.77% over the past year and 5.94% over the past 3 years. There is also no max 12b1 fee for this index fund. The total expense ratio is only 0.32%. The fund is rated 3 stars by Morningstar. 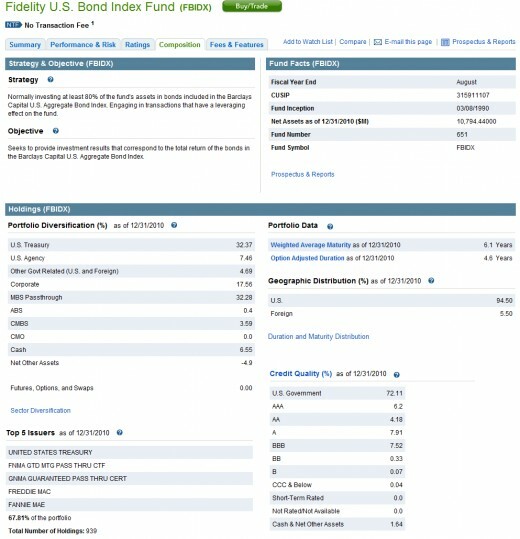 You will need to provide $10,000 minimum balance to purchase this Fidelity US Bond Index fund. The top 5 bond sectors of this fund are MBS Passthrough, US Treasuries, corporate Bond, US Agency / Government, Cash & net Other assets and CMBS. According to Morningstar, the average credit quality of the bond fund is A (investment grade rated). The Weighted Average Maturity bond is 5.5 years. As of January 2011, the top 5 bond issuers are United States Treasury, FNMA guaranteed pass through, GNMA guaranteed pass through, Freddie Mac, and Fannie Mae. Fidelity GNMA Fund objective is to provide a high level of current income. The fund normally invests majority of its fund assets in Ginnie Maes and repurchase agreements for Ginnie Maes. It also invests in other U.S. government securities. The fund lead manager is William Irving since 2004. The fund has returned 7.26% over the past 3 years and 6.75% over the past 5 years. The total expense ratio is only 0.45%. It also has a Morningstar rating of 4 stars. To invest in this fund, you will need an initial min investment of $2,500. The top 2 bond sectorsof this fund are MBS Passthrough (96.59%) and Collateralized Mortgage Obligation or CMO (11.44%). According to Morningstar, the average credit quality of the bond fund is AAA (top rated investment grade). The Weighted Average Maturity bond is 3.1 years. As of January 2011, the top 5 bond issuers are GNMA, GNMA II, Government National Mortgage, FNMA, and Federal Home Loan Mortgage. Note: Ginnie Maes or Government National Mortgage Association was established in the United States in 1968 to promote home ownership. Fidelity Strategic Income fund seeks to provide current income and capital appreciation. The fund invests primarily in debt securities, including lower-quality debt securities. It allocates its assets among high yield securities (40%), U.S. Government and investment-grade securities (30%), emerging market securities (15%), and foreign developed market debts (15%). The fund lead manager is Joanna Bewick since 2008.The fund has returned 9.38% over the past year and 8.40% over the past 3 years. The total expense ratio is only 0.74%. It also has a Morningstar rating of 4 stars. To invest in this fund, you will need an initial min investment of $2,500. The top 5 bond sectorsof this fund are High Yield Investments, US Government, Developed Market Debt, Emerging Market Investments, and Cash. As of January 2011, the top 5 country bond issuers are USA, Germany, United Kingdom (UK), Canada and Italy. Fidelity Short Term Bond investment seeks to obtain a high level of current income consistent with capital preservation. The fund will invest most of its assets in investment-grade short term debt securities. The fund lead manager is Robert Galusza since 2007.The fund has returned 2.50% over the past 3 years and 3.64% over the past decade. The total expense ratio is only 0.45%. Fidelity Investment Grade Bond fund objective is to provide a high level of current income. The fund usually invests >80% of assets in intermediate term of investment-grade debt bonds. The fund lead manager is Jeff Moore since 2004.The fund has returned 8.05% over the past year and 5.68% over the past 3 years. The total expense ratio is only 0.45%. Fidelity High Income fund investment seeks high current income and growth of capital. The fund invests mainly in income-producing bonds, preferred stocks and convertible securities, with an emphasis on lower quality debt securities. The fund lead manager is Fred Hoff since 2000.The fund has returned 9.10% over the past 3 years and 8.12% over the past 5 years. The total expense ratio is only 0.75%. To invest in this fund, you will need an initial min investment of $2,500. Fidelity Floating Rate High Income fund objective is to provide a high current income. The fund mainly invests majority of its assets (>80%) in floating rate loans. The debts may be non investment grade bonds and have high yield. The fund lead manager is Christine McConnell since 2002.The fund has returned 9.43% over the past year and 4.72% over the past 5 years. The total expense ratio is only 0.75%. To invest in this fund, you will need an initial min investment of $2,500. Fidelity Municipal Income fund seeks to provide high current yield exempt from federal income tax. This is the main fidelity municipal bond fund in this list. As we know, municipal bond fund income is tax free from federal tax and possibly state tax. The fund mostly invests majority of assets (>80%) in investment-grade municipal securities whose interest is exempt from federal income tax. The fund lead manager is Christine Jones Thompson since 2002.The fund has returned 4.20% over the past 3 years and 5.27% over the past decade. The total expense ratio is only 0.48%. To invest in this fund, you will need an initial min investment of $2,500. Disclosure: I have no affiliation with any of these funds. I also have no position in these funds. Please do your own research for additional details. Please trade and invest responsibly. Past Performance is No Guarantee of Future Results. 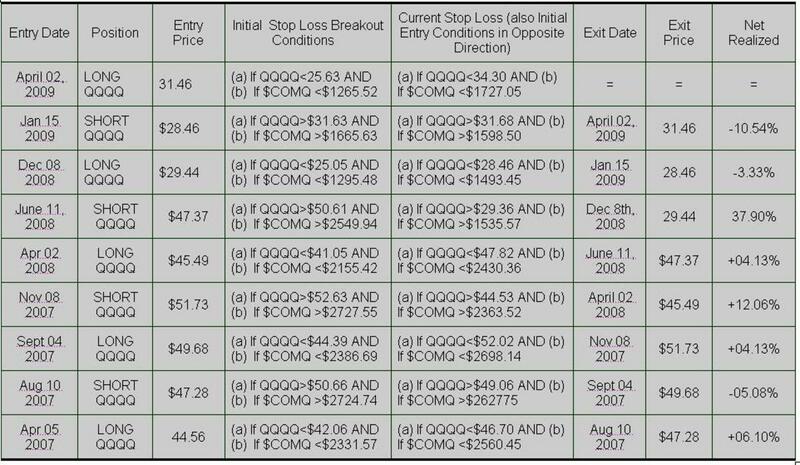 To purchase these funds above, you will need to have a brokerage account or 401k account which offers these funds in your account. 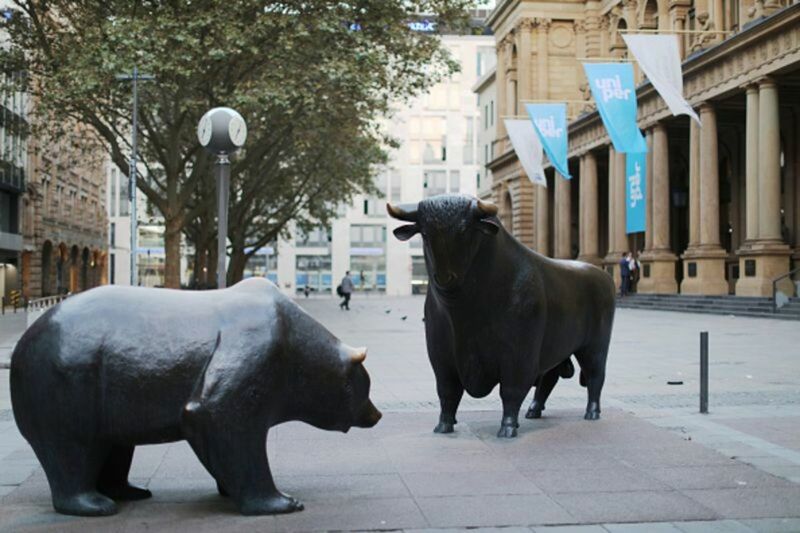 Several brokerages such as Scottrade, Firstrade, TD Ameritrade and Fidelity. I've owned FAGIX for years. Its definitely high risk and very volatile, so its not for the faint of heart. But as with many investments, the potential gain is higher due to its higher risk. While its a bond fund, I treat my FAGIX position as part of my equity holdings in determining my stock/bond asset allocations due to its high volatility.